Norcross, GA- Rovema NA, a leader in manufacturing of packaging machinery for the food industry, will showcase two Vertical Form-Fill-Seal (VFFS) Machines at PACK EXPO Chicago, November 6-9. 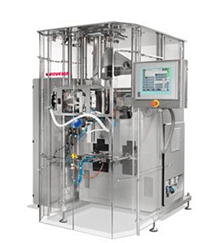 Rovema will exhibit the Continuous Motion BVK-260 VFFS Machine with the servo-driven SD-81 auger filler with Aroma-perm gas flushing system for residual oxygen levels below 2%; in addition to the Continuous Motion BVC-260 VFFS Machine, which will be programmed to produce 4-corner Stabilo style bags. Demonstrations of each machines capabilities will take place throughout the show at Rovema NA’s booth N-6150. As a leading packaging machinery supplier, Rovema manufactures and distributes equipment for dosing, vertical form-fill-seal baggers, cartoning and case-packing operations; primarily for the bakery, cereal, confectionary, coffee, dry powder, snack and frozen food markets. Capable of running up to 120 cycles per minute at format sizes ranging from 60-260mm, the Continuous Motion BVK-260 VFFS Machine is ideal for basic bag designs, such as pillow style bags and flat-bottom bags. 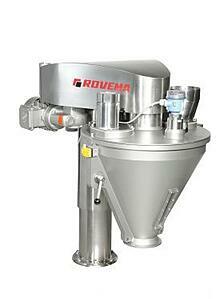 It was developed as a replacement to Rovema’s highly successful VPK-260 continuous motion bagger. Its’ servo controlled, continuous “D” motion cross seal station is at the heart of the machine’s efficiency in providing reliable sealing technology. Improvements of the BVK-260 over its’ predecessor include a smaller footprint due to an integrated electrical panel, the introduction of a solid, sanitary machine frame, as well as improved access for maintenance - including an improved guard door design that utilizes additional hinges to ensure ease of access to the jaw drive and jaw assembly. The Continuous Motion BVC-260 VFFS Machine, a dual-axis servo packaging machine is capable of running up to 210 cycles per minute at format sizes ranging from 60-260mm. Equipped with real-time control technology that is fully programmable and highly user-friendly; the BVC-260 is extremely flexible in the sizes and bag styles it can produce, which include pillow style, flat-bottom, Stabilo (4-corner), resealable zipper and more. Extremely reliable due to minimization of downtimes when running at maximum capacity, and flexible in its compatibility with many different packaging materials. The BVC-260 is equipped with Rovema’s innovative “Premium-Seal” system. “Premium Seal” offers the option to pre-heat and then compress multi-layered seal seam packing material for optimum seal integrity. Developed by Rovema specifically for the BVC Series, the programmable technology can be used for other applications as well. The BVC Series incorporates a patented “Sense and Seal” solution that detects if product is present in the cross seal area and, if so, discharges the bag without application of sealing pressure. This innovative system prevents any excess product from being accidentally sealed into the seal area, in turn eliminating product defects, as well as improving sealing tool efficiency and life expectancy. In addition to the automatic bag discharge of defective packages, this solution provides a reduction in downtimes due to jam clearance, and reduces wear and tear on cutting blades to ensure high efficiency and uninterrupted machine runs.